Cartoon Network Africa, the brand of Turner International, won a Promax Silver for its Cartoon Network April Fools’ campaign in the Best Entertainment Campaign category at the 2017 PromaxBDA Africa Awards. PromaxBDA aims to lead the international conversation about the role that marketing plays in the monetisation of media. It represents more than 10 000 companies and individuals in the media and media marketing sphere. Cartoon Network’s on-air prank campaign, titled ‘The Biggest Event in the Universe’, aimed to tease audiences with promos and an invitation to tune into the channel at 11:45 CAT on Saturday, 1 April. The team behind the scenes programmed promos and idents filled with jokes and deliberate misinformation. The campaign had a total of 121 539 children, between the ages of four and 14, tuning in for the event. Audiences continued to grow closer to the airing of the event, and despite the event turning out to be fake, viewers weren’t deterred as the audience ratings increased during the event itself. 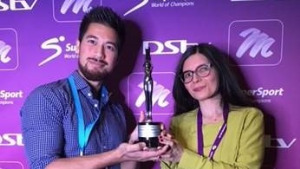 "It is quite an honour to win in a traditionally general entertainment dominated category with a kids’ brand, and once again shows the constant creative mind our internal teams offer to our imaginative and fun channel," says Jaime Ondarza, senior vice president for Turner Southern Europe and Africa. After being pranked, the viewers were shown 30-second gags from Cartoon Network’s Darwin and Gumball. For more information, visit www.turner.com. Alternatively, connect with them on Facebook or on Twitter. media update spoke to Turner Southern Europe and Africa's Jaime Ondarza about the appeal of African animation. Read more in our article, Why African animation has proven to have a local appeal.